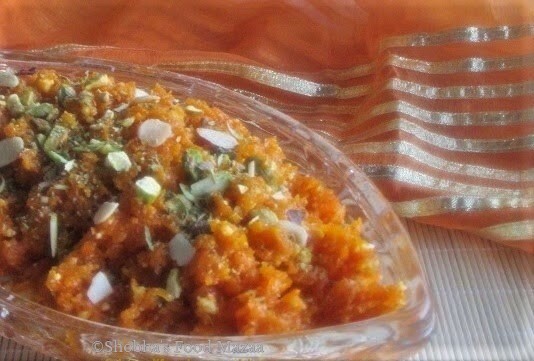 Gajar ka Halwa, also known as Gajrela is a traditional Indian dessert made from carrots. 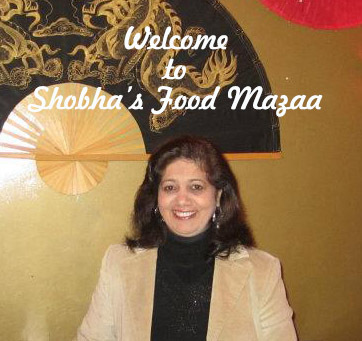 It is one of the most preferred Indian dessert. This sweet is mostly made during winters when the red, juicy and tender carrots are available. Though we have many recipes using the short cut method and adding consensed milk I prefer to make it the traditional way by simmering it and stirring from time to time though it is time consuming. Adding mawa / khoya is optional. Some prefer it plain.You can make it according to your personal preference. Cardamom Powder ... 1/2 tsp. 1. Mix 2 cups milk powder with 1 and 1/2 cups water and make paneer (cottage cheese) using vinegar or lime juice. 2. Drain and allow it to cool. 1 cup milk powder, the prepared paneer, 1 cup sugar, ghee and cardamom powder. 4. Spread it in a flat dish and microwave it for 3-4 minutes. 5. Now take a thick bottommed vessel and put the milk and grated carrots. 6. Cook until the milk is dry, stirring occasionally. 7. Add sugar, ghee and cardamom powder and stir it until the liquid is evaporated and the halwa starts leaving sides. 8. Now add the prepared mawa and mix well. 9.Garnish it with chopped almonds and pistacho nuts. You may also use silver warq to garnish. Yummy halwa, I love the addition of mawa to it. Makes it more yummy. 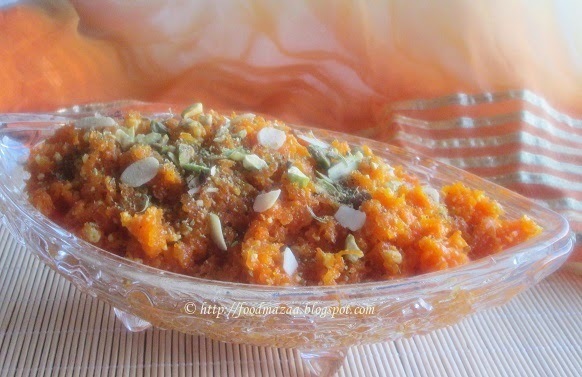 Never say no to carrot halwa, delicious! Halwa looks rich and yummy!!! My all time favorite halwa,looks yummy. Very beautiful halwa.. healthy dessert after a heavy meal..